Effort Computer Island has Joined forces for Victims of the West Virginia Flooding. 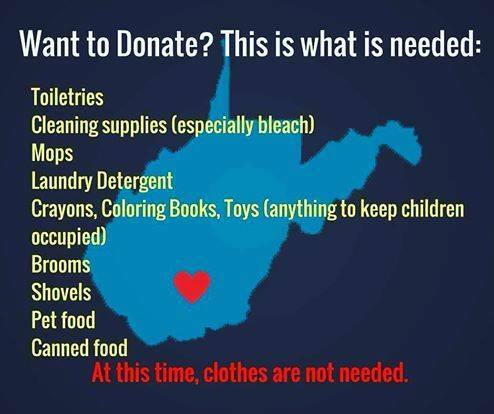 Hello All, as A community Effort Computer Island has Joined forces as a Drop Off Location for Items to be donated to Victims of the West Virginia Flooding. We need your help! Please see below. Thank You !! Please spread the word about the dropoff donations and also that we will be collecting items tomorrow at the Farmers Market & also at the fireworks show in the narrows right next to the stage at the Heritage Center. Thanks everyone!